Taipei, Taiwan -- ASUS launches the Eee PC S101, an exquisitely designed netbook for fashion forward individuals who view style as as much of a factor of success as substance. The Eee PC S101 builds upon the industry-pioneering form factor, ergonomics and features of its predecessors but boasts a wholly reforged exterior in three gorgeous colors—Brown, Champagne or Graphite—accentuated with delightful details such as premium Infusion finishes and crystal-adorned hinges, a successful melding of fashion and functionality that easily situates it at the pinnacle of netbook computing. 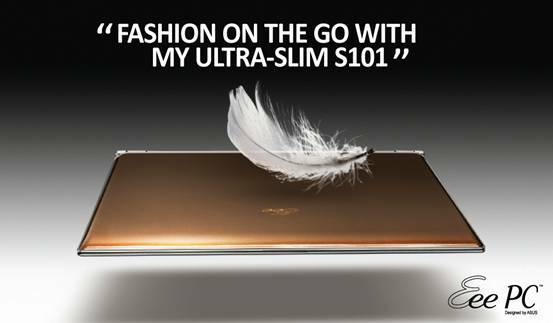 With its elegant styling and slender profile, the Eee PC S101 cuts a striking profile that complements any sartorial ensemble. Its unique colors emanate confidence, success and dynamism, and its incredible portability—weighing a mere 1 kg and svelter than most fashion magazines at just 1.8 cm—enables users to carry themselves with effortless grace, without the slouching and strain that often plagues users of regular notebooks. Its fantastic slimness, which has an uncanny ability to snare attention, enables it to tuck easily into most bags. Its head-turning looks and astounding portability aside, the Eee PC S101 is equally impressive in terms of features. It supports Wi-Fi 802.11n, enabling high speed Internet access virtually anywhere. It also features Bluetooth V2.0, ensuring fast and convenient connectivity with a vast range of Bluetooth-enabled devices. Every Eee PC S101 comes with an encrypted 20 GB Internet storage facility known as Eee Storage, allowing users to store and subsequently access their important documents and media securely whenever, wherever. Also keeping users’ data safe and sound is the Eee PC S101’s shockproof Solid State Drive (SSD) which maintains the integrity of the stored data even when subjected to knocks and shocks. The SSD has further advantages over traditional hard disk drives, such as silent operation and reduced energy consumption. The SSD comes in capacities of up to 64 GB. Rounding off the Eee PC S101’s comprehensive storage capabilities is an integrated 4-in-1 flash card reader that supports more formats than other Eee PC models. The supported flash memory types are MMC, SD, Memory Stick and MS-PRO. The Eee PC S101 is also equipped with a vibrant 10.2” wide active matrix LED-backlit display which is capable of running at WSVGA resolution, thus providing more-than-ample space for viewing documents and perusing other media. The Eee PC S101 features the exclusive Super Hybrid Engine (SHE) which greatly enhances its energy efficiency, letting users enjoy longer battery life per charge—enabling up to five hours of continuous use—thus eliminating the need to lug power adapters along with them. SHE also offers a choice of performance and power consumption modes that allow users to make quick and easy adjustments to suit their usage scenarios. Catering to users across the full spectrum of experience levels, the Eee PC S101 is available with either Microsoft Windows or GNU Linux. The Microsoft Windows version offers users with moderate to substantial computing experience with more configuration avenues and a wider spread of applications. The incorporation of Windows Live Messenger and Windows Live Mail ensures that all of the user’s communication needs are fully met, and the inclusion of Microsoft Works equips the user with the ability to work efficiently while out of the office. Less experienced users, on the other hand, will appreciate the icon-driven, point-and-click simplicity offered by the Linux version. An additional boon of the Linux version is that it comes with over 50 preinstalled applications that span learning, productivity and entertainment uses.